Founded in 1904 with only $501 in capital, the Hebrew Free Loan Association of Cleveland will soon celebrate its 110th anniversary. Its website proudly says: Come celebrate over 25,000 interest-free loans to local families - $8.5 million of support lent and repaid. The Blog on the Home page of its website www.hflaclev.org has a post (see the image above) "100 Years of Free Loans History" and invites a download. We downloaded and saved the pdf document, not knowing what to expect. What we found is the richest, most detailed history of a Cleveland Jewish institution we have ever seen on the internet. It begins with historical background to give us an understanding of the Jewish immigrants from Eastern Europe who were the Association's main client group in its early years. Lasky shows how the Association grew and responded to changing community and world conditions over its first century. 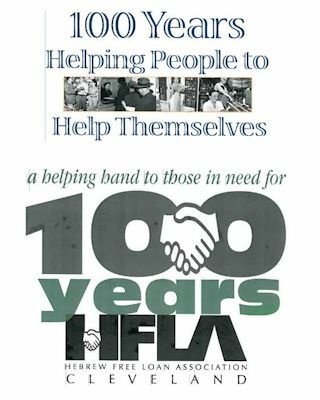 We learn that in 1905, only a year after its formation, the Association became a beneficiary of the Federation of Jewish Charities (today the Jewish Federation of Cleveland), though Lasky challenges the word 'beneficiary', noting that alone among agencies, the HFLA was expected to repay these funds. Lasky describes the changing needs over the years: the immigrants from Eastern Europe, then World War I, the depression, Jews fleeing from Germany in the late 1930s, post World War II pressures, and the arrival of Jews from the Former Soviet Union. He tells of the dedicated volunteers who led the Association and describes some changes they initiated. In the narrative can be found interactions, sometimes tense, with other community institutions. Editors of the English and Yiddish Jewish publications - Daniel Wertheimer, Maurice Weidenthal and Samuel Rocker - were strong supporters. The trustees came from all segments of Cleveland's Jewish community with one glaring exception: for its first 66 years the HFLA resisted giving women a seat on the board. The history ends with an assessment of the present (2003) state of the Hebrew Free Loan Association. After citing sources for 113 footnotes, Lasky presents many detailed appendices. We find short biographies of its charter members, data on assets and lending, the locations of its offices over the years, lists of executive directors, secretaries and trustees, and a list of the major donors, with short biographies, who have raised its loan capital from an original $501 in 1904 to $641,000 in 2000. Anniversary publications of charitable organizations (for many years the HFLA insisted that it was not a charity, nor were its clients accepting charity) usually have a fundraising aspect. This booklet was no exception. It ends with 15 pages of ads expressing congratulations and wishes for future success. This document is more than a history of an organization. Stanley Lasky has given us a view of our community and portrays a century of the lives of Clevelanders and the Association that was there to help them in times of financial need. This document was a great gift that was hidden from view: never mentioned in the Cleveland Jewish News nor, until recently, on the HFLA website. View or download this .pdf document on the Cleveland HFLA website. Read our suggestions for working with large Adobe Reader ® (.pdf) documents. Stanley Lasky earned Bachelor and Masters degrees in History and Political Science at Western Reserve University, followed by a PhD in Sociology at Kent State University. For many years he was a teacher and administrator at Cleveland Heights High School. After two years of intensive research on antebellum Jewish Cleveland he and Nancy F Schwartz, then curator of the Jewish Archives of the Western Reserve Historical Society, co-authored "Jewish Cleveland before the Civil War". It is the best study we have of Cleveland's Jewish pioneers, with a detailed data base listing more than 800 persons. Testimony to the quality of the research is that the Journal of the Society for American Jewish History (AJHS) published it in two issues: the essay in its last issue of 1994, followed by the appendices in the first issue of 1995. This major work can be found on these pages. For "Jewish Cleveland before the Civil War" click here. Dr Lasky was ideally situated to write "The Hebrew Free Loan Association 1904 - 2003". He had served on its board since 1994 and in 2001 he had organized the Hebrew Free Loan Association archives at the WRHS. Stanley Lasky and his wife reside in Cleveland Heights. This is our second effort to give a web presence to the remarkable work of Cleveland historian Stanley Lasky. The first was in 2013 when we found that the online archives of the Journal of the American Jewish Historical Society, which span more than 100 years of publication, somehow do not include the issues published in 1994-1995 and thus did not include the monumental study that he and Nancy F Schwartz had co-authored: "Jewish Cleveland before the Civil War." We scanned the essay and appendices and published them on this site, their only internet presence. Read the Schwartz-Lasky essay. Read the appendices. Dr Lasky's study "The Hebrew Free Loan Association 1904 - 2003" is also deserving of an improved web presence. There are three ways we can assist. Visibility Currently the HFLA website's blog page gives this history document high search rank (#2 in Google). When that page is gone, this page should easily found. At our request the Encyclopedia of Cleveland History has added a link from its page on the HFLA to the document on the HFLA web space. Ease of use The .pdf document presents another challenge. It appears to have been created by scanning a copy of the booklet. This is understandable; who among us can retrieve an 11 year old word processing file? The result is that the .pdf document is not searchable. Today's .pdf creation software allows adding links and bookmarks. To help the readers of this 72 page document we plan to develop a table of contents that in one click could go, as an example, directly to the list of donors of loan capital.